The mushroom, according to McKenna, had also given humans their first truly religious experiences (which, as he believed, were the basis for the foundation of all subsequent religions to date). Another factor that McKenna talked about was the mushroom’s potency to promote linguistic thinking. This would have promoted vocalisation, which in turn would have acted in cleansing the brain (based on a scientific theory that vibrations from speaking cause the precipitation of impurities from the brain to the cerebrospinal fluid), which would further mutate the brain. All these factors according to McKenna were the most important factors that promoted evolution towards the Homo sapiens species. After this transformation took place, the species would have begun moving out of Africa to populate the rest of the planet. 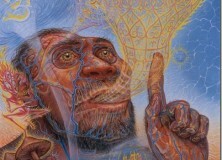 Later on, this theory by McKenna was given the name “The ‘Stoned Ape’ Theory of Human Evolution”. I’m fairly sure this just offloads part of the craziness onto McKenna, but I might name drop the theory next time I’m looking for a more lively reaction when discussing language origins. N.B. This is one of my many posts that was written some time ago. I decided to publish in 2012 just in case the customer was right about our impending doom. With that out of the way, we can now focus on the critical issues surrounding the size of a language’s phoneme inventory and the distribution of Psilocybe cubensis. Another hallucinogen that has been linked to religious experience and language is the sap of the acacia tree, which Shanon (2008) suggests caused Moses to perceive the burning bush which spoke to him. Shanon, B. (2008) “Biblical Entheogens: a Speculative Hypothesis.” Time and Mind, 1(1) 51-74. Maybe the sap of the acacia tree, when combined with magic mushrooms, led to our ancestors getting stuck in a psychedelic loop where they kept embedding phrases within phrases. Or are human species, and speech – the same thing? Just by different names ? To ‘stoned apes’ experts at least (if not to anyone else)?